With Lost drawing to a close next year, it's time for networks to start finding their follow-up to the #1 serial drama on television. The networks have been trying to copy Lost's success for years, but this fall there are three new shows that might come closer than any of the others have. These three new shows, Day One, V, Flash Forward, and all have some of Lost's cast or crew, and carry many of the science fiction elements that fans of Lost are looking for. Will one of them become the new Lost? It's possible, but not likely. The first of these shows is Day One. Unfortunately, it has absolutely no chance of replacing Lost, because it will only air thirteen episodes, forming an effective post-apocalyptic miniseries. The series, created by Lost alum Jesse Alexander, will also star Thekla Reuten, who you may remember as being Sayid's femme fatale love Elsa in "The Economist." Javier Grillo-Marxuach, a former Lost writer has been hired as a writer as well. The series is reportedly about "life on earth following a global catastrophe that has devastated the world's infrastructures. An eclectic band of survivors, all residents of one apartment building, embarks on a quest for survival." It will air on NBC in fall of 2009. Personally, I'm looking forward to this miniseries. While it will most likely not be on the same level as our favorite Island drama, it will likely solve as a nice replacement to the cancelled series Jericho. The fact that it's written by some Lost alumni makes it even more appealing. Second up is the remake of the 1980's television series V. Starring Elizabeth Mitchell (Lost's Juliet) as Erica Evans, this series is a modern-day retelling of Invasion of the Body Snatchers. The show concerns contact with a seemingly peaceful group of aliens, who have secretly been plotting to take over the Earth for a very long time. Elizabeth Mitchell is not the only selling factor of the show: check out this trailer to see more about what everyone is so excited. V will air on ABC early next year. Thirdly and finally is my pick for next year, the new show Flash Forward. Created by The Dark Knight writer David S. Goyer, Flash Forward is based off the book of the same name by Canadian sci-fi writer Robert J. Sawyer (great name, huh?) about an event in which everyone on the planet blacks out for two minutes and experiences a vision of the future. I'm currently in the middle of the amazing book, and I can't wait to see this turned into a television series. You may have noticed advertisements for this series in between episodes of Lost. 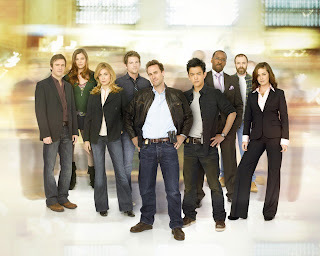 The series will star John Cho, Joseph Fiennes, Jack Davenport, and Lost's own Sonya Walger, who we know as Penny Hume. Seth MacFarlane is also slated to make a cameo appearance. It will also air on ABC in the fall. If you're interested in finding out more about this series, please check out the Flash Forward Wiki on Wikia. Will any of these shows replace Lost? It's not likely. Lost brought to television such a combination of action, mystery, theology, philosophy, and ambiguity that perhaps nothing will ever be quite the same as it is. But sometimes they get fairly close. Hopefully, one of these three will get the closest.